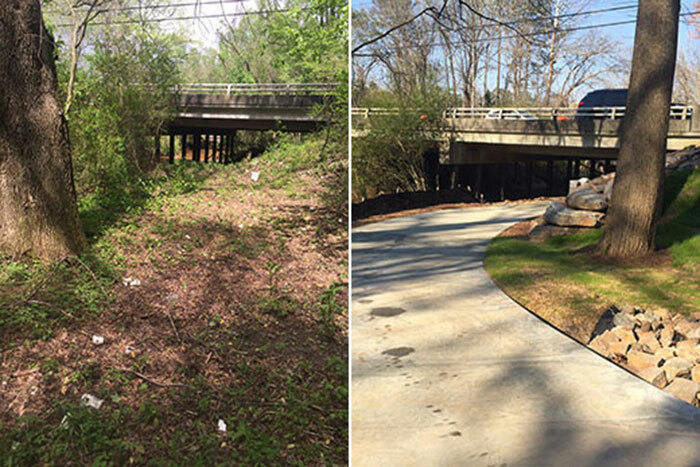 Before and after: Once a mess of weeds and litter, the new PATH trail provides a safe route for pedestrians and bikers to cross under Clairmont Road. 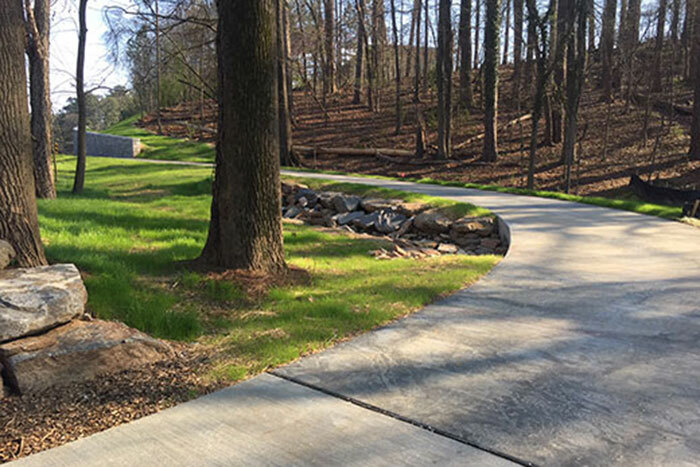 Complete with granite walls and a paved surface, the pathway connects Emory’s Clairmont Campus to Mason Mill Park. From Mason Mill Park, bikers and pedestrians can continue on the network of PATH Foundation trails, including the section from Mason Mill to North Druid Hills at Spring Creek Road, which opened over the summer. 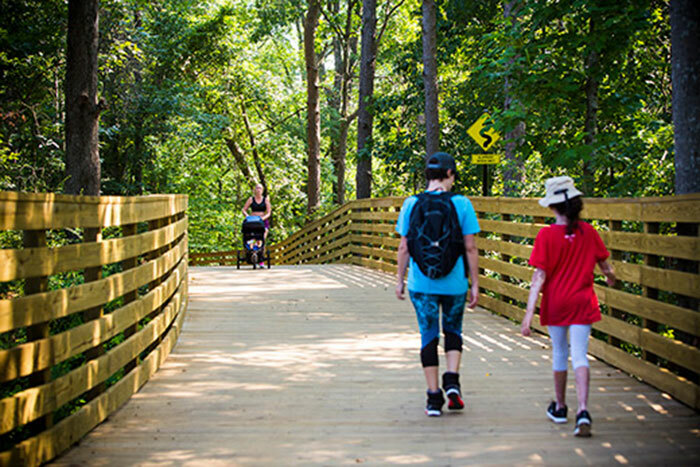 A public ribbon-cutting ceremony is planned for the grand opening of the PATH at Emory, a new bicycle and pedestrian trail that links Emory’s Clairmont Campus to Mason Mill Park and points beyond. The project, developed in partnership between Emory and the PATH Foundation, an Atlanta non-profit dedicated to developing public greenway trails, features a 12-foot-wide trail that runs from the Mason Mill Tennis Center, crosses under busy Clairmont Road, and ends just inside the front gates at Emory’s Clairmont Campus. Designed to accommodate bicyclists, pedestrians and joggers alike, the path allows those who use it to continue along traffic-restricted Starvine Way onto Emory’s main campus. Emory celebrates the opening of the path Friday, April 20, at 10 a.m. at the entrance to Emory’s Clairmont Campus, located at Starvine Way and Clairmont Road. The event will feature a formal ribbon-cutting and several speakers, including Ciannat Howett, director of sustainability initiatives at Emory; Ed McBrayer, executive director of the PATH Foundation; Becky Katz, chief bicycle officer for the City of Atlanta; and local community leaders. A tree will also be planted to commemorate Earth Day, which is April 22. Everyone is invited; those attending should bike, walk or carpool, as limited parking is available at the Starvine Parking Deck. The celebratory event will also recognize the realization of a long-term working relationship between Emory and Atlanta’s PATH Foundation, says David Payne, senior director of operations in Emory’s office of the executive vice president for business and administration. The completed pathway offers a new, safer commute option and a key connection for bikers and pedestrians from both the Emory community and neighboring employers along the Clifton corridor. The project was also designed and constructed with an eye toward environmental sensitivity, Payne says. In addition to cleaning up the weedy banks of the stream bed beneath the Clairmont roadway that was often filled with litter, the pathway features inviting aesthetic enhancements on the Emory side, including new granite walls. The overall plan fits with Emory's 2025 Sustainability Vision, which calls for enhanced opportunities for safe biking and walking on campus and to surrounding trail networks, Howett says. “The new PATH Foundation trail brings its robust trail systems to Emory's gates and is an exciting next step in fulfilling our vision," she notes. Since winter 2016, a working group composed of faculty, staff, students and representatives of DeKalb County, the city of Atlanta, the Centers for Disease Control and Prevention (CDC) and nonprofit bicycle and pedestrian advocacy groups have been meeting to examine bike and pedestrian connectivity across the Emory campus and identify future steps, Howett says. The 2025 Sustainability Vision also commits Emory to exploring options for an on-campus Emory trail network similar to the Atlanta Beltline that can, over the next decade, link to existing and proposed off-campus trail networks. In addition, the new Emory PATH has the capability to help take cars off the road. “Along with the trail that we are opening, we are starting construction to extend it into Mason Mill and Medlock parks,” McBrayer says. The PATH Foundation partners with communities to create off-road pathways. To date, PATH has created 265 miles of traffic-free trails throughout metro Atlanta and other communities in Georgia, South Carolina and Mississippi. In the Atlanta area alone, they’ve opened nearly 100 miles of trails, notes McBrayer.